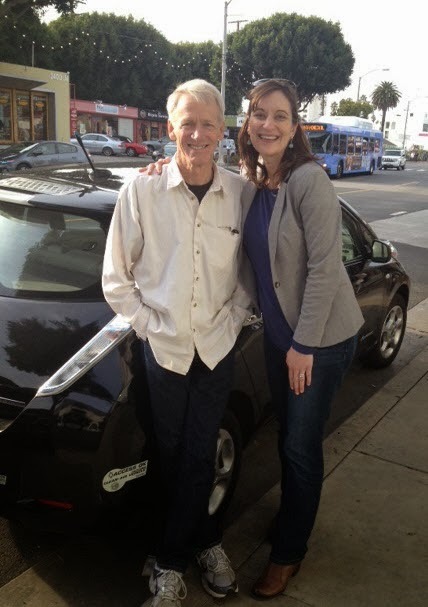 Paul & Jen in Santa Monica with his Nissan Leaf . My interview with Paul Scott, founding member of Plug In America, had me laughing and shaking my head as we discussed the future state of electric vehicles and renewable energy. Paul had made his voice heard in the clip, "Who Killed The Electric Car" with Martin Sheen and Ed Begley, Jr. as well made an impact with President Obama, Nissan, and Electric Vehicle Association of Southern California. He is such a well connected, interesting man that is an advocate for change in our generation. Why care? That is the ultimate question. Why does it all matter if we sit in 4-hour traffic jams, pay $4.55 for a gallon of gas, or drill for natural gas? Simple answers are money and time. We are living off finite resources, but more importantly paying for really cheap electricity (pennies per Kwh; not dollars). Our outages in the U.S. are measured in days, while Singapore measures in seconds. We are guilty of playing politics, just the same as other nations, as we soak up our independence for getting in our vehicles at any point in time. Thus, why not have better infrastructure is the right question to ask ourselves? We can have electric vehicles for feasible, acceptable rates with significant tax rebates (at the federal and state level), which is seen in WA, OR and CA. Transits, buses, local municipalities, and state highways are all in need of support. 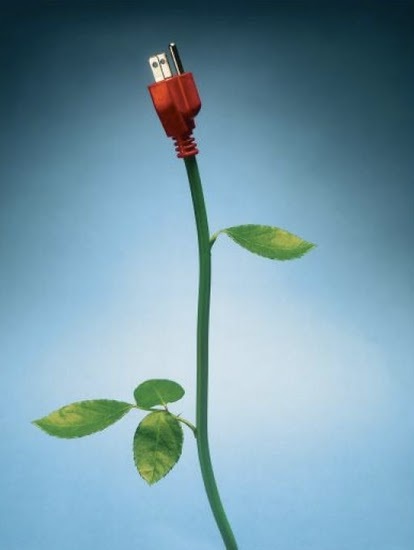 Moreover, the critical component to our messy, political debate is that construction, like education, including the development of electric vehicle technology, solar, geothermal, cannot be outsourced. Our generational planning for 2014 will augment our movement of "Made in the U.S.A." and train our skilled labor force (young and old) to be prepared for not just another trend, but an economic demand that cannot be overlooked. Tesla, Solar City, Nissan, Uber (which Google significantly recently funded), Brammo are some examples of the new level of entrepreneurship and leadership that will get us off gasoline, and better guided to diversified generation (even if that means nuclear, natural gas, wind, solar and more). Gone are the days of the old as a new generation will kick into motion a lifetime of stability and conversation that educates, excites, and explores. Money is continuing to move into Cleveland and the first of its kind in the U.S., the Lake Erie Energy Development Co. of Cleveland (LEEDCo) will launch offshore wind turbines on Lake Erie using $4 million in federal money. LEEDCo is a non-profit that was awarded the funds will primarily focus on testing offshore wind by installing 9 turbines on ice breaker foundations (designed to reduce ice loading) roughly 7-miles out (3MW). "The United States has tremendous untapped clean energy resources, and it is important for us to develop technologies that will allow us to utilize those resources in ways that are economically viable," U.S. Secretary of Energy Steve Chu. "Today's announcement of awards to the first offshore wind projects in the U.S. paves the way to cleaner, more sustainable, and more diverse domestic energy portfolio." LEEDCo was 1 of 7 organizations selected by the DoE and this is certainly an epic wind for Clevelanders. The electric dream began back in the 60's when BMW tested their 1-602 model series during the Munich Olympics. Since that time, the race has continued for propulsion, zero emission tailpipes, and plug-in hybrids allowing the flexibility for gas and renewable sources. The turning point was in 2004 with the advanced release of the lithium-ion battery for vehicles which had proven their worth in laptops, cellphones, and other consumer devices. But nothing is better than the smooth and quiet ride of an electric vehicle, feeling the regenerative braking, and knowing that electronauts are helping to move our green economy forward. If you are interested in being one of the test fleet ActiveE drivers (700 released), sign up here for a two year lease to help our economy be on the edge of innovation. In Hawaiian, makani means wind. It also is the new identity for, The Makani Airborne Wind Turbines, who was recently awarded $3 million from the Department of Energy’s ARPA-E program, and has also received $20 million in funding from Google. They essentially resemble a fleet of mini airplanes that are launched when wind speeds reach 3.5 meters per second. 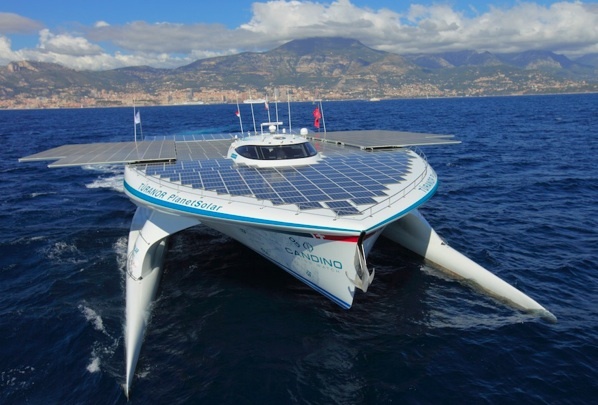 Rotors on each blade help propel it into orbit, and double as turbines once airborne. The blades are tethered to the ground with a cord that delivers power to throw them into the sky and receives energy generated by the turbines to be sent to the grid-connected ground station. The wings take on a circular flight path once in the air (perpendicular to the wind’s direction – sometimes called the wind window for you kiteboarders out there!). Wind speeds can generally be twice as fast at altitude than near ground level as well, making airborne blades potentially more powerful than ground-based turbines. 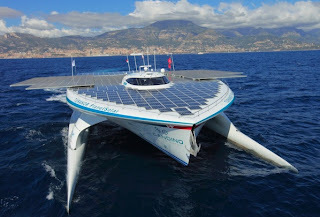 Their light weight material also makes them cheaper to produce than traditional turbines, and maintenance work can be performed on the ground. 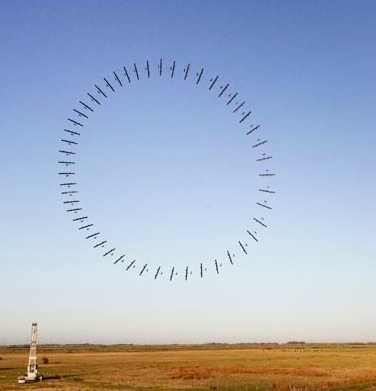 While these turbines have potential, they are still being tested. Makani plans to construct larger wings that can reach heights of 1,600 feet and power 600 homes. The company’s current timeline for the largest prototype is 2013, with hopes of starting commercial production two years later. 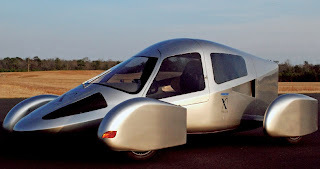 Edison2 was the research and manufacturing team that made the "Very Light Car". 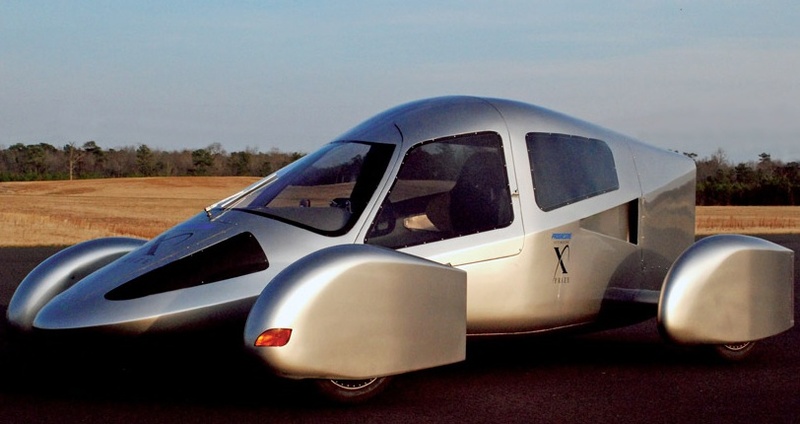 While its name is simply and elementary, the best part is that it won $5million (in the mainstream class) from the Progressive Insurance Automotive X Prize. If you have been under a rock and don't know about the X Prize or what it stands for, then I highly recommend you engage in some quality Inter-web time to review. The four-passenger vehicle was accredited by the EPA for obtaining 245-mpg equivalent for the stringent test (delivering a combined 350-mpg in the standard test), almost three times that of the best market models. 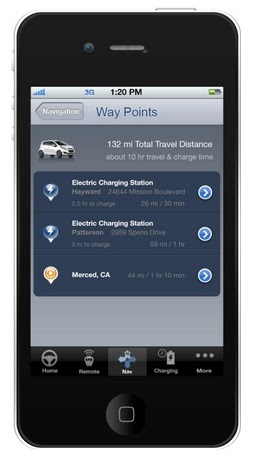 The car fully charges from ordinary household outlets within six hours, enabling a range of 114 miles. If this car had a theme it would be, "design by competition, formed through competition and favored by physics." More simply, it is the most efficient automobile platform ever built. National Plug-in Day was on 10/16 - an unprecedented nationwide observance drawing global attention to the environmental, economic and other benefits of plug-in electric vehicles through simultaneous events staged in at least twenty major cities nationwide. 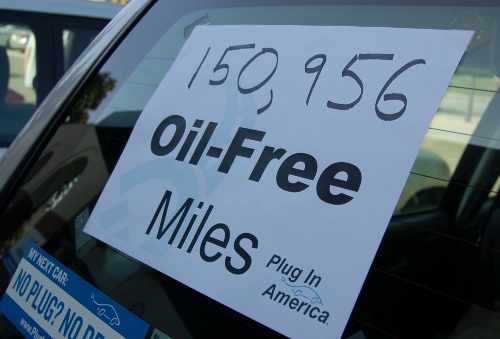 Plug In America, the Sierra Club, and the Electric Auto Association teamed up to plan for this effort, which notified cities across our nation to commence plug-in parades, tailpipe-free tailgate parties, test-drives and other grassroots activities. Our flagship event will be a huge parade of plug-in vehicles in the L.A. area. Chris Paine, director of the films “Who Killed the Electric Car?” and “Revenge of the Electric Car,” has agreed to be among the speakers at this celebration. We expect to at least double the number of vehicles from history’s greenest procession, the 78-vehicle parade staged by Plug In America in 2009 (and 180 in Santa Monica's 2011) was in sync with President Obama’s inauguration. Electric vehicles already enable thousands of miles of cleaner, petro-free driving. Help tell the world about the benefits of driving on electric avenue!